"If we know what signals are active in cells that become, let's say beta cells in the pancreas," said Slavov, who is an assistant professor of bioengineering, "we can provide those signals to other cells that we want to instruct to become beta cells." "If you take those into account, then there are hundreds of thousands, if not millions of proteins," Slavov said. "We haven't ever measured all of them." Experts in the field of proteomics, the large-scale study of proteins, thought it would be impossible to measure thousands of proteins within a single cell, Slavov said. Existing techniques weren't specific enough or required a much larger sample size than the contents of an individual cell. "People thought that we were very far away from having the sensitivity to analyze material from a single mammalian cell," Slavov said. "I did not even pitch this when I started my lab." Slavov's method relies on mass spectrometry, a way of weighing molecules and their fragments. This has reliably been used to quantify proteins in the past, but typically requires a much larger sample size. This makes the sample large enough to process and increases the likelihood that any peptides lost in preparing the sample will be from the unimportant filler material. It also makes it easier to identify the rarer peptides from the target cell. If the amount of a certain peptide is too low, the machine doesn't have enough information to tell what it is. Dumping in extra peptides, while still making them easy to separate by their barcodes, helps the more scarce molecules to register. "This was the highest risk, highest reward idea that I had," Slavov said. "I initially was reluctant to start this project with an undergraduate," he said, "But Ezra, a first- year undergraduate at the time, expressed very strong interest in the project and he certainly rose to the challenge." 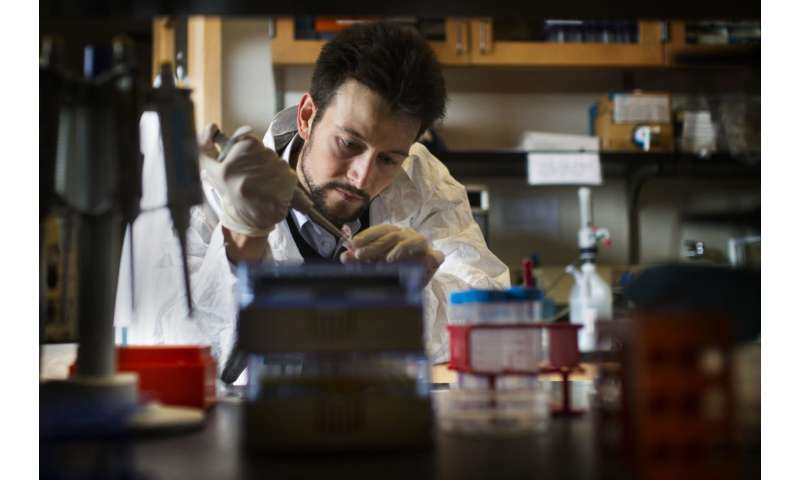 "We are not interested in measuring just a single cell," Slavov said. "We want to measure tens of thousands of single cells." "This was never about a single method that was going to stay static," Slavov said. "This paper is much more of a proof of principle that opens the door to a lot of further development." "There is a whole community that is coalescing around those ideas," Slavov said. "Now that we have this proof of principle, I expect to see a lot of progress." "This was an incredibly risky project that worked out great," he said.